I have loved this project from the start. Do they make you feel as happy as they make me? 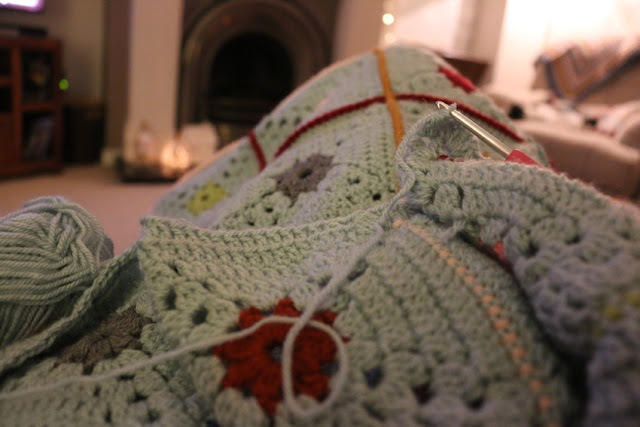 It's been an especially nice project too because I feel like I've hardly worked on it at all and yet somehow, a blanket has appeared. I'm not sure how that is possible, maybe just because I enjoyed making those squares so much. But after testing things out by making a few and then settling on the final colours, I decided to get all those pretty little centre rounds, or flowers, as I prefer to think of them, all made up first. It always reminds me slightly of a factory production line when sit I crank out so many of the same little shapes at once and then set them all out in neat orderly ranks of colour! But a factory sounds like a rather grey and dreary place and not something I associate with the joy of making, so maybe Santa's workshop would be a better analogy. A much more colourful and fun place, with toys all lined up ready to bring joy. Yes that's much more like it! Once those little 'forget me not dot' centres (as I'm calling them) had all been made, it was really just the most pleasurable thing in the world to sit with my duck egg yarn, dip my hand in to my colourful bag of middles and then work up the rest of the squares. So beautifully simple, mindless and soothing. Something I can't seem to get enough of just lately. 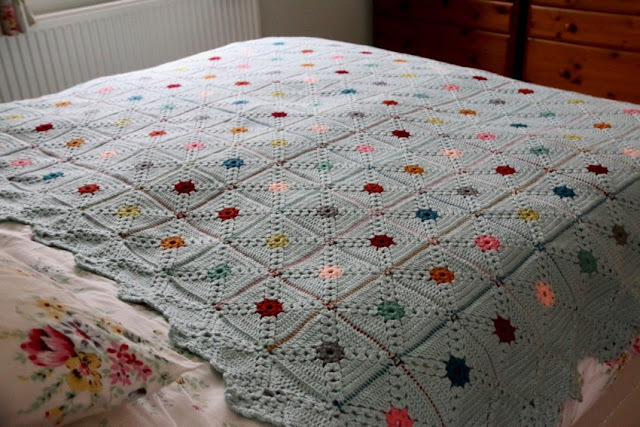 I originally came across the pattern for this twist on the regular granny square many years ago, when my Nan shared one of her crochet projects with me. 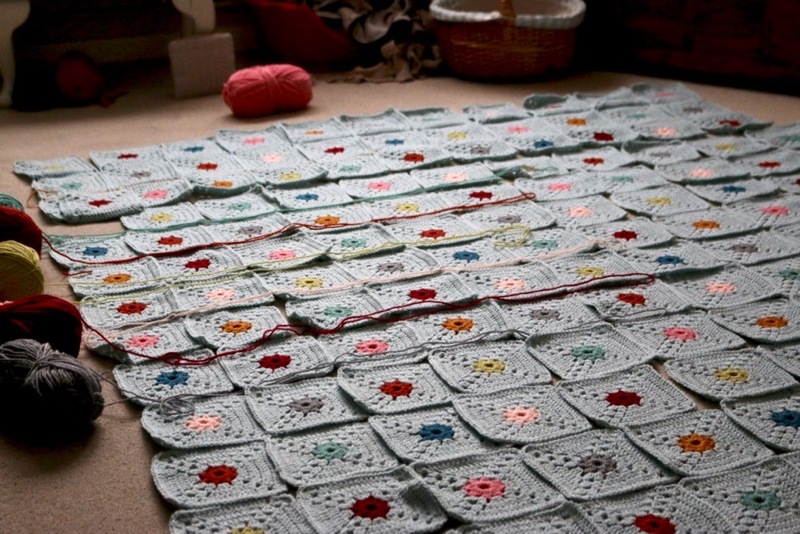 She'd started making these very squares from some old crafty magazine from her stash. I can't remember the name of the magazine, but it was in black and white and the pages were very well thumbed. She was getting a little older then and tended to just make patterns that she could remember off by heart. But she wanted to continue making more of these squares, so she asked me to read the pattern and show her what to do. It was written in entirely different language than we would use for directions now, but we managed to figure it out and the pattern obviously stayed with me. So these squares are ones that I have made from that memory and as well as being a very pretty pattern, that makes it just that little more special. Many of you have been asking me for the pattern for this square, but at first I wasn't sure quite where to direct you. Although this is a common enough pattern, I had no idea of the name. In fact, I still don't. Searching through on Ravelry, I have found versions of it and there seems to be no consistent name for it. I also think I altered the pattern very slightly in my mind as I tried to recall it, as it differs very so slightly from any others I found. 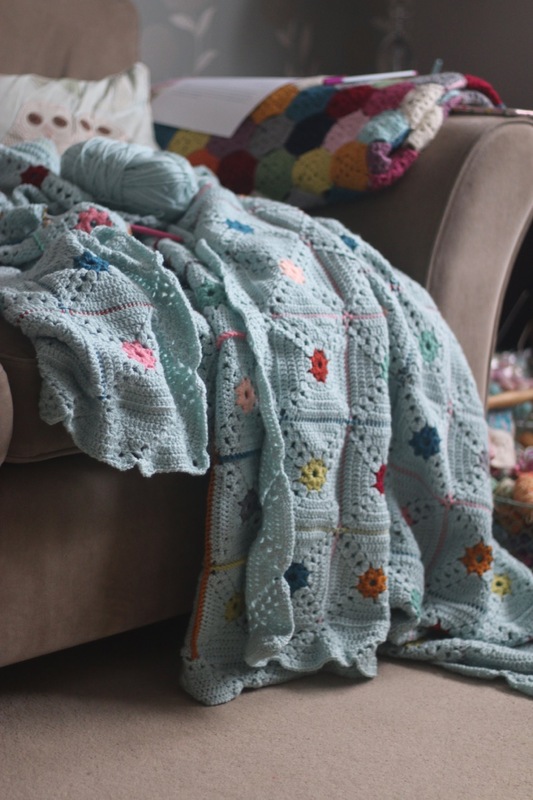 I do plan on writing up the pattern for this blanket, so I will include the way I make my squares, as well as all the joining and border directions for you. In the meantime, if you don't want to wait and would like to look at the patterns I did find, then I'll pop links at the bottom of the post. I've been working on these squares just here and there between other projects. Sometimes for several nights in a row, sometimes just one or two a week. I took them to Yarndale with me, and I made them at the lovely meet up at Black Sheep Wools, when the A Spicier Life CAL was on. And so, somehow without me really noticing, I found myself with 143 squares all ready to join. I had planned, all along, to have a nice wide border, all in the same duck egg colour and so I'd naturally assumed that I would be joining in the same colour too. But just as I reached the end of those squares a rebellious little voice in my head piped up with the notion of making the joins in a contrasting colour to stand out. In fact, in several contrasting colours as I ended up using all the various centre colours to make the joins. I'm not sure where the idea came from, but it wouldn't go away and so I decided to go for it. A quick little Insta poll confirmed my choice, but by quite a narrow margin. 58% to 42% at last count, if I recall. It was a surprising little twist and a choice that I wasn't expecting to make, but I'm still happy with it. Everything was smooth sailing in fact until it came to the border. This is were the work began! The blanket may have made itself, but the border did not. The border was a little bit of a slog. I knew what I wanted to achieve, so I thought it would be easy but I was very wrong. The first part of it, mimicking the pattern of the squares was fine. A little trial and error soon had that decided. But how to actually finish the border, the very last edging part. That was a lot trickier. I tried out many different variations and samples before I found something I was happy with and thought I was home free. So, I started working round and round. I normally enjoy the border, it's like the home straight of the project, but this was a little more tense as I couldn't wait to see how the overall effect would look. Each of those border rounds took quite some time too. I sewed in the ends, laid it with pride on my bed, smoothed it out, stood back, admired, considered. I carried on 'considering' for a good few days, each time looking at that pesky border. I didn't want to admit it, but something about it just wasn't right. 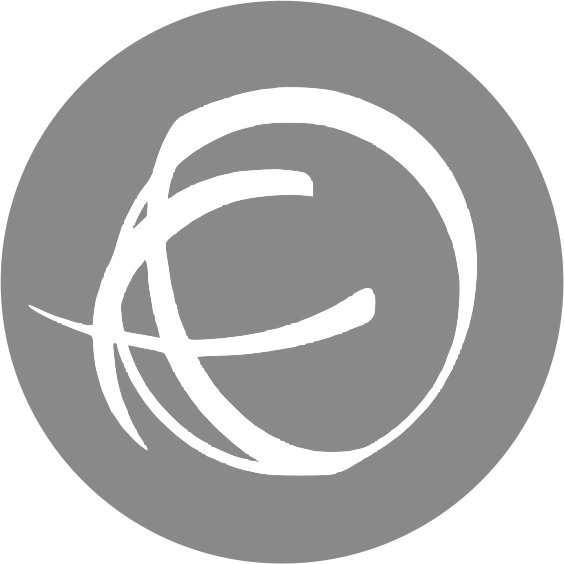 After much pondering, and much staring and mulling over what might be done, I finally came up with an idea of how to change it and decided to give it a quick try. At first I was afraid I'd have to frog quite a lot, but I wanted to try something with just the last round first. I ripped back a little way and tested out an alternative last round.. yippee and hip hooray, it worked! It looked so much better straight away and I knew I'd found the answer. So I ripped back all the way round and re-crocheted and fixed with glee. Now my blanket is finished. Now I am very, very happy! 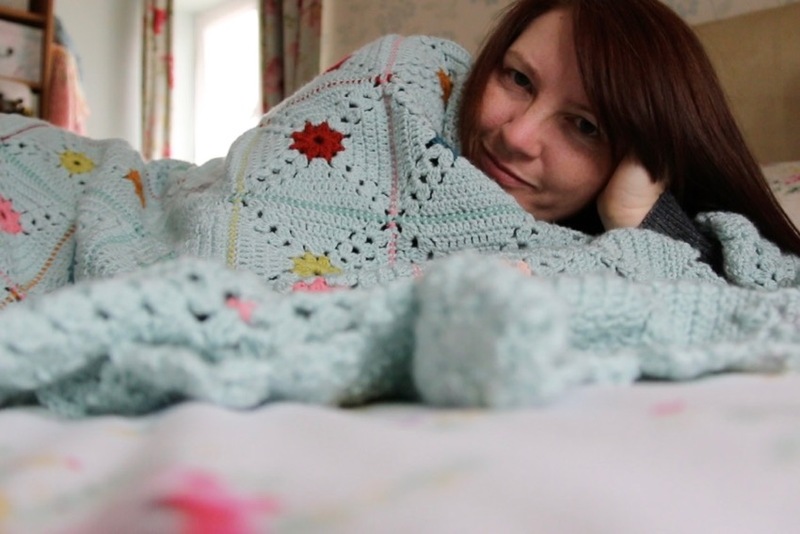 I'll include all the yarn, yardage and colour info when I release the pattern in the New Year, but I do have some details on my 'Forget Me Not Dots' Ravelry project page now. 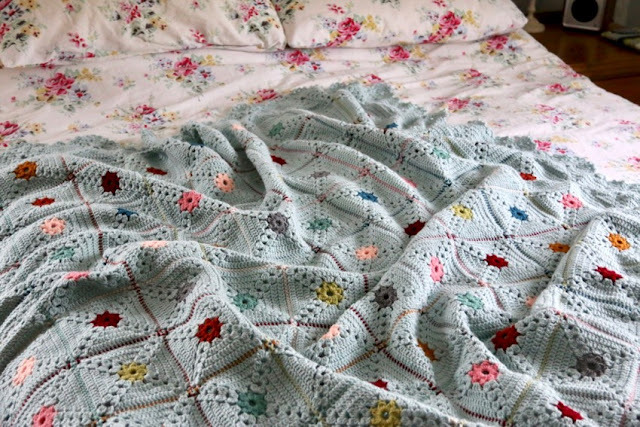 I've had a picture of this identical blanket saved for a couple of years in case I got around to making one (as you do). I do love the way the colours pop in the middle of the duck egg. I love your latest project Sandra. It looks so cosy and the colours are perfection. 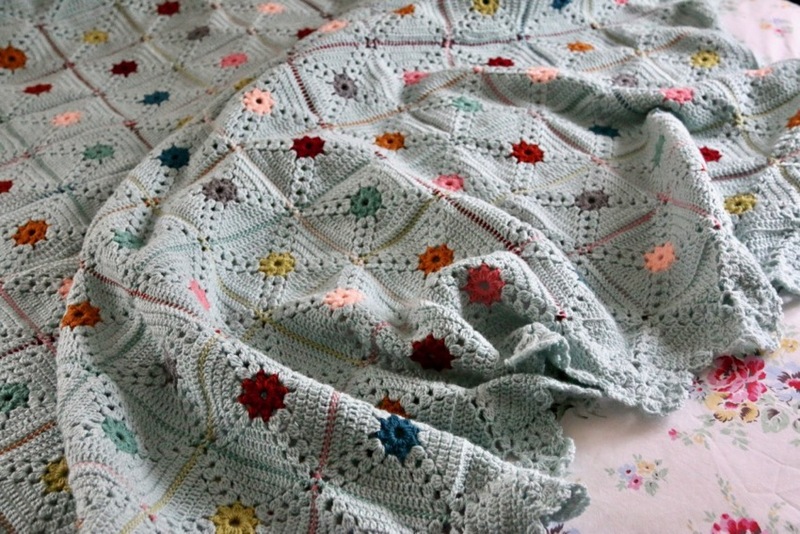 I also love the border you designed, it finishes the blanket off perfectly. I really love what you made! And the colourful joining makes it stunning! 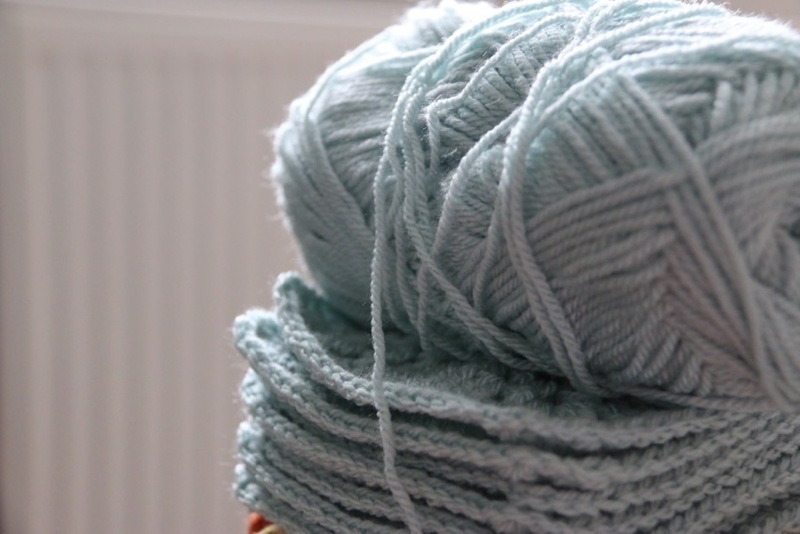 Looking forward for the pattern (by the way, link nr 1 and 3 go to the same Ravelry-page). Your new blanket is beautiful, Sandra. 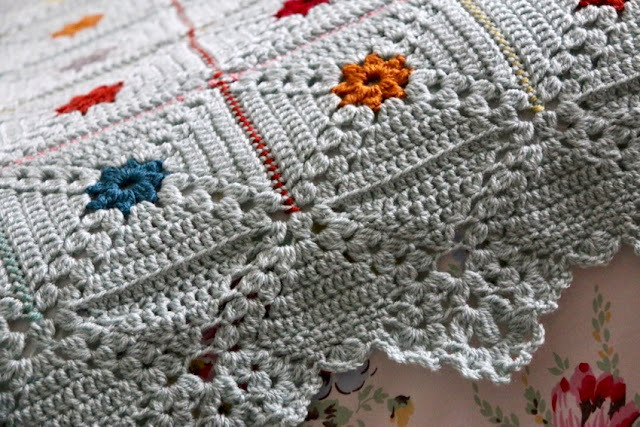 I love the simplicity of the pattern and the final border is gorgeously retro! Well done! This is beautiful. That border though! I absolutely love it, but I can only imagine how long I would take! Your blog inspired me to begin crochet again after 0 years of time away. I told myself I could make that red Kath Kidston-like granny, and I did! 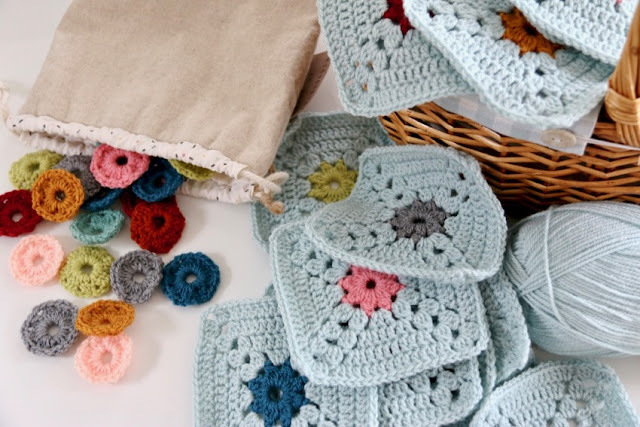 I decided it was great fun for me and I would do granny squares until I grew bored of them... With so many beautiful colors, I fell in love with Stylecraft yarn and still love the granny variations... My worst problem is taking the plunge to join the squares. I put that off too long! Anyway---love this! An adorable beautiful blanket . It would be hard to resist making that. I look forward to seeing your pattern. Best wishes for Christmas, you have maybe snow, we down under are roasting.Merry Christmas. Beautiful all the way through, but I love your genius border. That just sets it off. Waiting for the pattern, too. You are so clever. It's so beautiful Sandra! I was one those suggesting you to use duck egg for the joining... But this looks much better! And oh my... That border! Gorgeous! 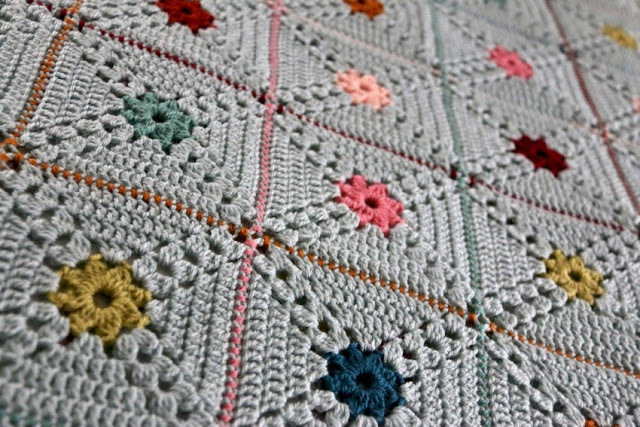 A lovely blanket, I love it all, the border is really special, good on you, I will be waiting for the pattern. Carolyn. This is stunning, absolutely beautiful. 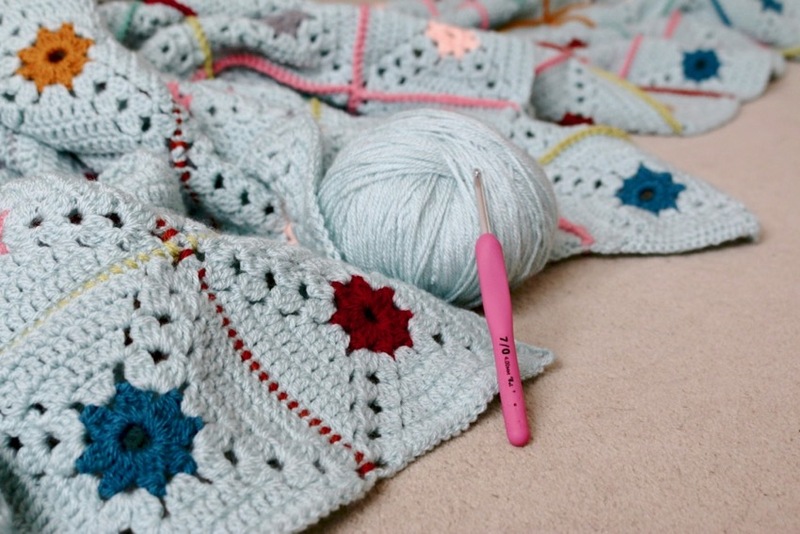 I'll be pinning because it's too lovely not to with the wild hope of having a go one day! What a true beauty. And what a lovely post, both informative and personal. 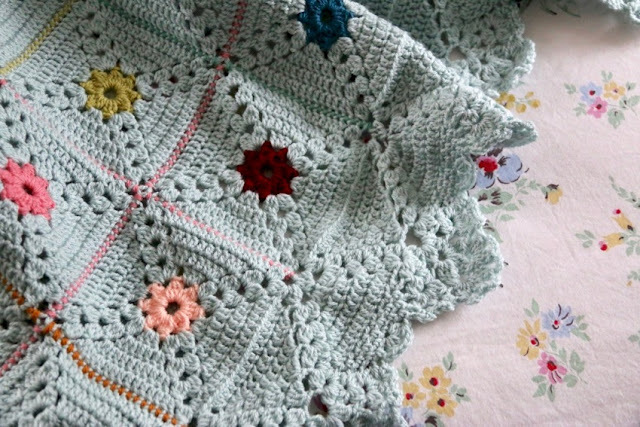 Talking about your Nan getting older and how you figured out the pattern from old magazines together... naming your blanket Forget Me Not... adding that vintage like border and using those old school colors that are just so you... In a way all these pieces put together and it feels a bit like this blanket is a tribute to your Nan, although she is still with you and hopefully will be for many more years to come. But still... Maybe that is not at all what you had in mind, but that is what I see when reading between the lines you see... Now cuddle up under that blanket and enjoy your holidays. I'm waiting for my love to come back home in a couple of days and we've said to put our PJs on and not take them off four 4 days... I'm looking forward to that. Super chillaxing and just good old family time. That is a lovely blanket. Sometimes the simplest of ideas are the most effective! Although it is a traditional square, I have come across the pattern in a Darla Sims book - it is no.15, "Afghan Square". Yes, I totally agree! Thanks so much for the link, it's one of those classics that pops up everywhere isn't it? Love you blanket. Waiting impatiently for the pattern. Will choose mushroom as main colour. I think it will also look great. It's amazing - I'm making (well, it's been neglected for some time) a similar blanket in very similar colours https://xelenacrochets.blogspot.ru/2016/06/blog-post_9.html! Your border is stunning! THANKS for the inspiration, dear Sandra ! 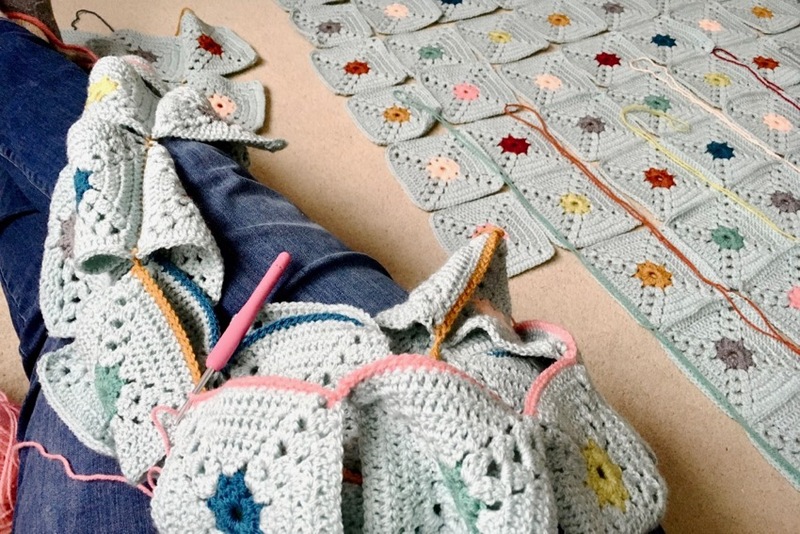 Noww I'll paiently wait for your pattern & tutorial, which are always so great ! What a beautiful blanket Sandra. I can't wait for you to publish the pattern used to do the border! Any idea ehen you'll have that available? Thanks for sharing your lovely works. What is the fished size of the blanket, before adding the border? 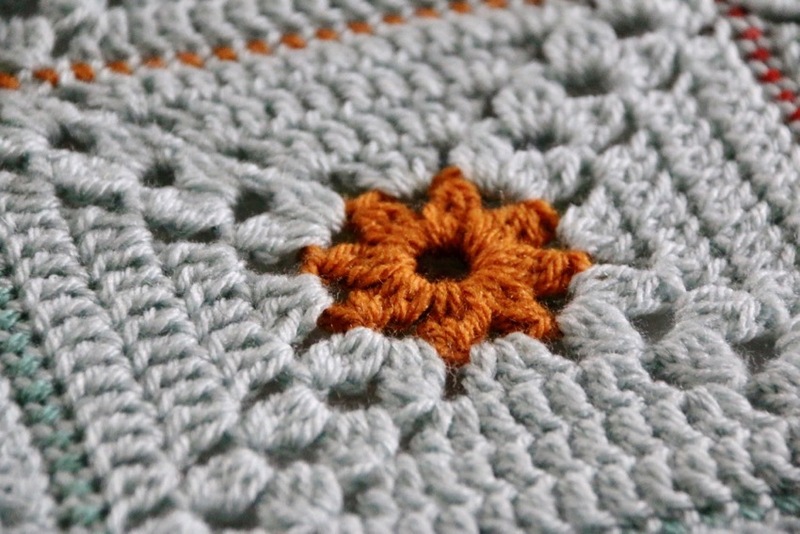 And is the border pattern (still excitedly awaiting it!) 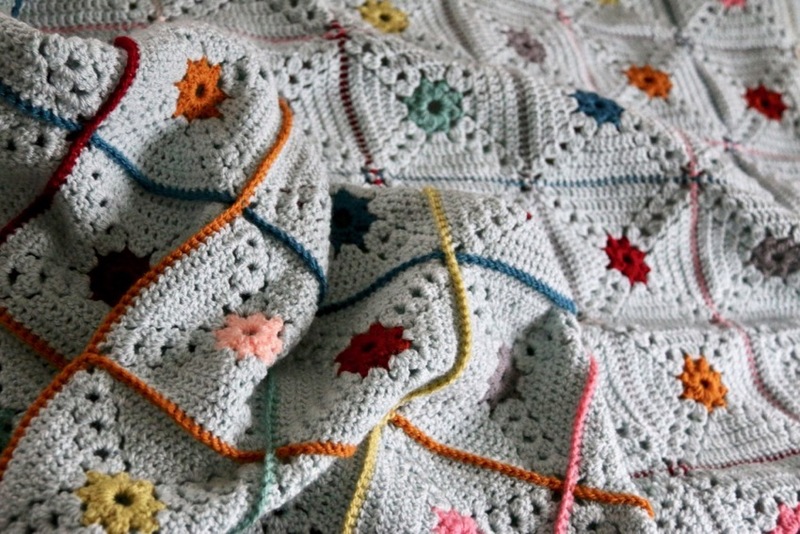 easy enough to modify if I want to make the blanket bigger (i.e., add more rows/colums of squares)? Have a look at my latest blog post my lovely. Pattern is out now and you'll find all the details there (or linked there)! Love this afghan and the border is beautiful.